Research shows strong bilingual pre-K programs work. But how many states have them? Only 5 states have policies in place for strong, bilingual public pre-K programs, which greatly benefit children, especially from low-income families. Karla Medina-Gomez was worried as she prepared to enroll her two oldest children in a state-funded pre-K program around eight years ago. “One of my first questions when I went to register them was: ‘Well, what’s going to happen? They don’t know how to speak English,’” recalled the mother of four, born and raised in Newark, New Jersey. Medina-Gomez, whose parents emigrated from Ecuador, said her two oldest, grew up in their home speaking only Spanish. But she also knew the importance of exposing them to English-language instruction at an early age. Her two oldest, now 12 and 13, were fortunate — their pre-K had bilingual teachers and aides, and the classroom included objects labeled in English, Spanish and Portuguese (commonly spoken in Newark), which helped ease their linguistic transition. She credits the pre-K for her children's current academic success. “Had they not gone to preschool and maybe started kindergarten, I’m sure they probably would have been more ESL,” said Medina-Gomez, referring to English as a Second Language instruction. Children who attend pre-K are more ready for school at the end of that year, particularly in literacy and math, than those who don’t got to pre-K, according to a 2017 report by a task force from the Brookings Institution, the Washington think tank, and Duke University. But policies across the country that support bilingual students in state preschool programs vary widely, both in quantity and quality, according to a recent report for the 2016-17 year from the National Institute for Early Education Research (NIEER) at Rutgers University in New Jersey. Of the 35 state pre-K programs in the report with such policies, only five states — Kansas, Maine, Minnesota, Nevada and Texas — employed at least seven of the nine policies surveyed, which include permitting bilingual instruction, providing extra funding, and screening and assessing children in their home language. And while research has shown that a highly qualified teacher is one of the most important factors in raising student achievement, only six programs in five states required lead teachers to have qualifications or training related to educating preschool bilingual learners. Recent changes in federal policy have shown that progress in early education depends more than ever on states, Barnett said. That includes the Every Student Succeeds Act, an Obama-era re-authorization of a federal law passed in 1965. The reauthorization, which received bipartisan support in Congress, cedes more control and authority to states and local districts. The NIEER report — which surveyed 60 state preschool programs that are funded, controlled and directed by the state, and reached at least 1 percent of the state’s 3- or4-year-old population — said just over 1.5 million children attended state-funded preschool in the 2016-17 school year. Nationwide, around 23 percent of preschoolers were bilingual learners, defined as speaking another language at home besides English. While 43 states, D.C. and Guam provide publicly funded pre-K, only three states — Alabama, Michigan and Rhode Island — met all 10 new benchmarks for minimum preschool quality standards in the report, which include staff professional development and whether teachers have a bachelor of arts degree. Nine states — including some with the largest numbers of children in poverty — had fewer than half the benchmarks. The survey found that state spending on pre-K more than tripled from 2002 to 2017, rising from $2.4 billion to over $7.6 billion. When adjusted for inflation, it represented an increase of almost $4 billion. But a different view emerges when looked at through the prism of per-child investment. While states in 2002 spent on average around $3,500 per preschooler, the amount in 2017 was a little over $5,000, according to the survey. That actually represents a decrease of around $400 per student when inflation is factored in. What’s more, spending per preschooler varied greatly from state to state in 2017. New Jersey, for example, doled out over $12,000 on each child compared with Nebraska at just under $2,000, according to NIEER, which began tracking state preschool enrollment, spending and policies in 2002. “Spending per child is directly related to program quality, as it determines what resources are available, including the likelihood of retaining qualified teachers,” the report concluded. Federal money also figures into the equation. For instance, the Head Start program, which promotes school readiness for children 5 from low-income families up to age 5, provided around $9.2 billion in funds from Oct. 1, 2016, to Sept. 30, 2017. Preschool development grants were also awarded in 2014 to 18 states, totalling close to $230 million. Renewable each year for four years depending on funding, the federal grants support states in their efforts to build up high-quality preschool programs and expand them to high-needs communities. The NIEER report called those grants “an example of an effective state-federal partnership,” supporting more than 48,000 children in the 2016-17 year. “Whether those will continue into the future depends on administration priorities and Congress,” Barnett said. Quality preschool education particularly benefits children who come from low-income or disadvantaged homes, according to Claude Goldenberg, a professor of education at the Stanford Graduate School of Education who is not connected with the NIEER report. Around three in five dual-language learners who are 8 and under live in low-income families, according to the Migration Policy Institute, a nonprofit. A section in the Brookings and Duke University report noted that the immediate benefits of effective pre-K programs for all children may include improved achievement scores and lower rates of having to repeat a grade, among others. Longer-term gains may go even further, it suggested, and include higher rates of high school graduation, reduced crime and welfare use, and improved health. The report’s consensus statement, however, stopped short of drawing broad conclusions about longer-term effects of state and district pre-K, saying the evidence was mixed. It also noted that not all pre-K programs are equally effective. Although the NIEER report found total enrollment in state-funded preschool had increased, the numbers still varied across states. While four states had programs serving more than 70 percent of 4 year olds, 12 states had programs that enrolled just 10 percent of them. As for bilingual learners, some state preschool programs might be letting them down. 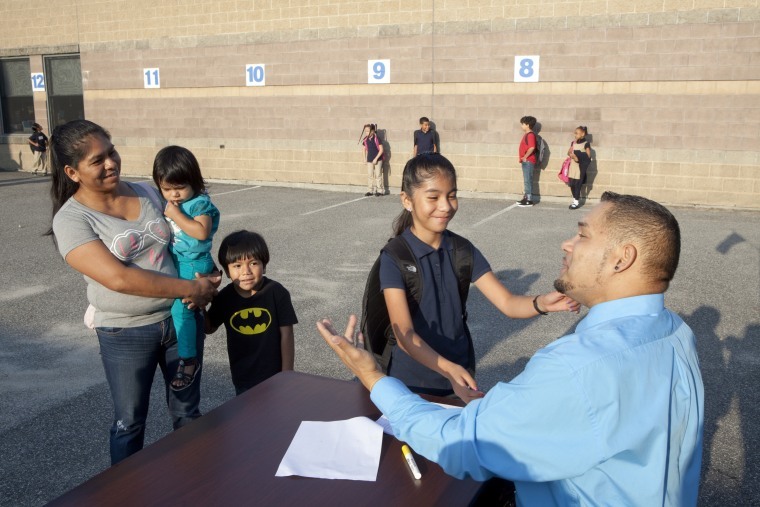 Hispanics, at 62 percent, make up the majority of bilingual learners in the age 8 and under bracket, followed by whites at 16 percent, Asians at 15 percent and blacks at 6 percent, according to the Migration Policy Institute. The NIEER survey noted that 35 state preschool programs have specific policies to support dual-language learners, and all of them allow bilingual instruction. But it also found that out of 14 programs, only six required lead teachers to have specific training or qualifications related to working with bilingual learners, and just three required that they have bilingual certification, a potential source of concern. Goldenberg said the research on teacher qualifications for bilingual learners in preschool is sparse, adding that teachers who are more effective in general tend to be more effective with English language learners. Barnett added that there is a need for more teachers who are prepared to handle the wide range of challenges a student learning two languages may face. “Teachers need to understand how those children are learning and developing in terms of language and literacy and what they can do to support that,” Barnett said. CORRECTION (April 25, 2018, 10:44 a.m. ET): An earlier version of this article misattributed the source of a comparison of the amount spent on preschooler funding by New Jersey and Nebraska. The comparison was published by the National Institute for Early Education Research, not the Brookings Institution.